It turns out that finding a good walking stick or cane is not easy as you might think. 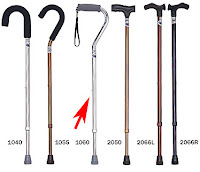 When I first started using a cane I was having only slight balance issues, but my psychologists suggested that I start using one more as a social signal to people around me rather than an actual mobility aid as at the time I was just starting to have enough difficulty to make me feel uncomfortable. But not enough for the people around me to realize there was in fact something wrong and I wasn't just drunk or stoned. I started with the one shown in the image. It only cost about $25, and for the price it worked okay. I did find it a bit heavy and awkward to control. This is also largely to do with the fact I was starting to have quite a bit of atrophy in my arms and hands. So, not being terribly happy with this cane and actually starting to need it more at this point. I started to look around for alternatives. What I really needed was something that was light, well-balanced and within T-shaped handle. I found very little that would work for me in handicap retail stores or that was actually being offered to me through my rehabilitation facility. 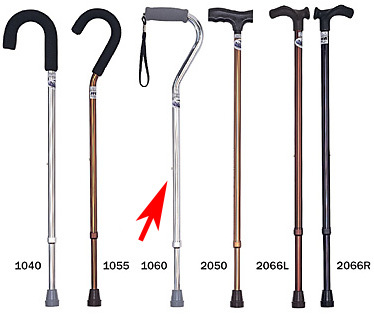 So I decided to start looking at trekking poles. Thus when I stumbled across the wanderfreund-speed-lock by LEKI. I only found this particular model for sale in one retail store here in Montréal. It seems to be a less popular version and consequently not many people have stock. However for my needs this cane was perfect. This cane was very light and easy for me to manipulate. The best thing about it places the balance point was much higher making it easier for me to keep away from my foot. The other MS canes tended to be heavier out at the end which would cause me to occasionally kick them as I walked. Needless to say this is kind of dangerous. The wanderfreund-speed-lock length is very easily adjustable as wherewith the MS Cains I would have to have someone do it for me. Not to mention it is designed to be collapsible, which is really handy for when you're out saith the movie or show and you don't want it sticking out into the aisle. You can collapse it down to a length of about 65 cm. Not shown in the image is actually was under the rubber foot, which is a carbide tipped. The rubber foot is actually just a You can place over it to use or generally. Living in a city where the weather can be pretty cold and crappy for part of the year, this is really handy. If things are slippery hiking use the carbide tip to guarantee that I will bite into whatever surface I stick it on to. I really liked this cane and wish I could continue to use it. Unfortunately my hands have degraded to the point right can't really hold it anymore without some sort of help. For a long time I was using a wrist wrap to attach myself to the cane, however the attending short in my right hand has made this no longer a viable option as it is a bit painful to do so. For the cost of about $70, I got a lot of miles on this cane. The one thing to be concerned of is that the foot is substantially smaller than the MS cane and if you're not careful can easily fit through things like the gap at the elevator door or a sewer grate. As I felt I still needed the use of a cane, hyped this to my rehabilitation people. Explain to them the problems with the grip and that I would need something to help me grasp the cane. Unfortunately the solution was less than satisfactory. They came back to me with another team that was very much like those from the MS Society mentioned above, only with a custom grip to which they riveted some neoprene and some Velcro so I can wrap it to my hand. This only sort of worked as now I'm considerably weaker than I was and this cane although a little more comfortable hold was far too heavy. Despite requests to remove the handle from this new came and adding it to my LEKI one, they would not. The next option I considered was the Side Stix crutches. These are more ergonomically designed for obtains are made of carbon fiber and are extremely light. they even have a shock absorbing spring the shaft. They are quite expensive, costing between $600 and $800 for a pair. But they will sell them as individuals for half the price. 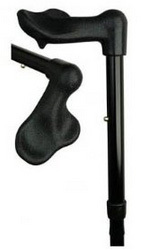 When I was back in Vancouver, I tried one out for a bit and they are far superior to the regular forearm canes. Sadly, given the atrophy in my hand I still have the same grip problems and would require myself to be attached to the cane, both at the hand and forearm. For forearm canes this is quite dangerous, should I happen to fall I could probably severely hurt myself and possibly even break my forearm. This is quite a disappointment to me as I did find these canes to be very good. Even with my limited dexterity I was able to maintain far more control over the cane than any of the others I had tried to date. Howdy! First of all I would like to state that you truly succeeded in making a gorgeous resource. Also I am so excited to ask you one thing that I am curious about. Have you ever taken place in some sort of competitions between online blogs?